Wine. Nibbles. Neighbors. It’s a story time for grown ups! 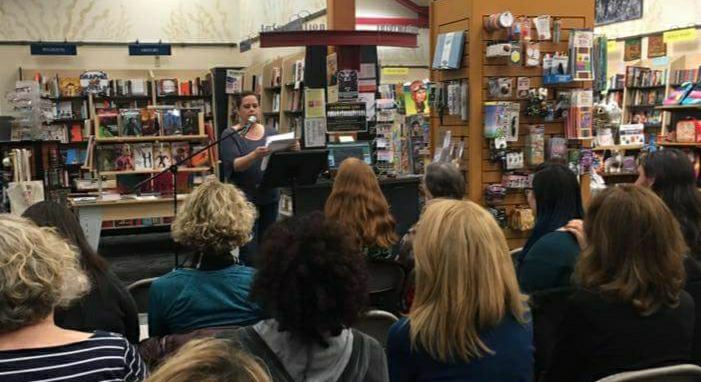 Join us on the third Thursday of every month, January through October, for an evening of storytelling in a popular book store in a bustling downtown, presented by members of To Live and Write in Alameda. 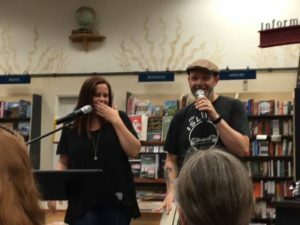 This monthly showcase of our literary endeavors has a little something for everyone: Tears, laughter, introspection, inspiration, and even snort laughter. We embrace adult content; leave the kiddies at home. Interested in sharing your work at a night of Alameda Shorts? 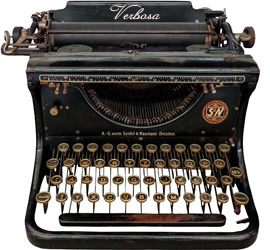 Personal essay or short story only (save the poetry for Local Voices: A Broken Mic). Word document only. Times New Roman, 12pt. Indent paragraphs; no space between paragraphs. Length: 1,000 words or less (must be read out loud in less than five minutes). Attach document; do NOT cut and paste into the email. Put your name inside the attached document! This is important. This is a curated event; if your piece is selected, you will be expected to attend at least one practice in the week leading up to the event. Newbies are required to attend two practices. If you are unable to do so, or unable to present on the night of Alameda Shorts, the reserve will be offered your place. Practices in Alameda and online; TBD based on who is selected to read. 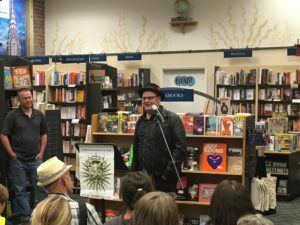 Alameda Shorts is hosted at Books, Inc. Alameda on the third Thursday of each month (January through October). Join us. You know you want to. Compensation: Exposure, practice, bragging rights, and a chance to share your work with a live audience. *There’s no charge for our basic “Friends” membership. Become a member of our community by asking to join us on Facebook. Do you have to?!? YES! We’re a writers support group, which means we strongly encourage participation of some kind, for your own benefit. That’s the whole point of the thing. Many of us live on an island, but none of us actually is an island. Try it. You may be surprised by how much you like us. 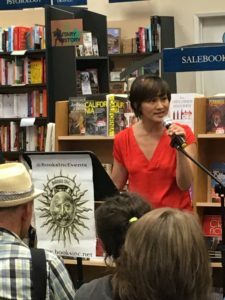 Dulce Zamora takes charge of the mic at our first Story Slam on May 12, 2016. 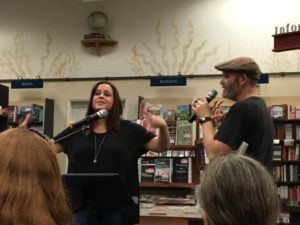 It was standing room only at the May 12, 2016 Story Slam at Books, Inc. in Alameda. Eric AK, reading, gets a chuckle out of the crowd as fellow member, Eric Johnson waits his turn. Photo Credit: Amos White. 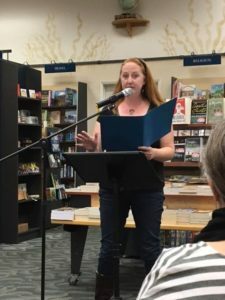 Erica Peck, reading, leads the audience through a spooky adventure in a Spirit Store that was worthy of the best of Twilight Zone on October 19, 2017. Photo Credit: Robin Heyden. Free wine. Great company. Fantastic storytelling. We have way too much fun at these things, and we’re not sorry. 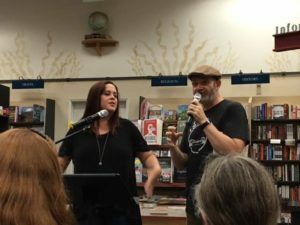 Co-hosts Bronwyn Emery and Hank Hedland ham it up at the last Story Slam of 2017. Photo Credit: Robin Heyden. For more information, email info@toliveandwrite.org.